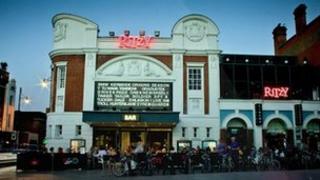 Cineworld has bought rival cinema chain Picturehouse for £47.3m. The all-cash deal sees Cineworld add Picturehouse's 21 cinemas to its current 80 sites across the UK. Stephen Wiener, chief executive of Cineworld said: "This acquisition gives us an opportunity to accelerate our growth by reaching new audiences in a high value and growing part of the market." To help fund the deal, Cineworld is to raise £16m through a share flotation. Picturehouse focuses on showing independent and foreign movies. Its managing director Lyn Goleby said: "The unique character of Picturehouse cinemas will remain, and our team will continue to bring the widest range of film to customers." Picturehouse's cinemas include The Little Theatre in Bath, the Cameo in Edinburgh, the Phoenix in Oxford, and Aberdeen's Belmont.